← The Week in Tiki (Nov. 16-29, 2015): The Hukilau’s Tiki Tower Takeover sold out, Trader Vic’s battles critics, Tiki Farm releases 15th anniversary mugs, more! 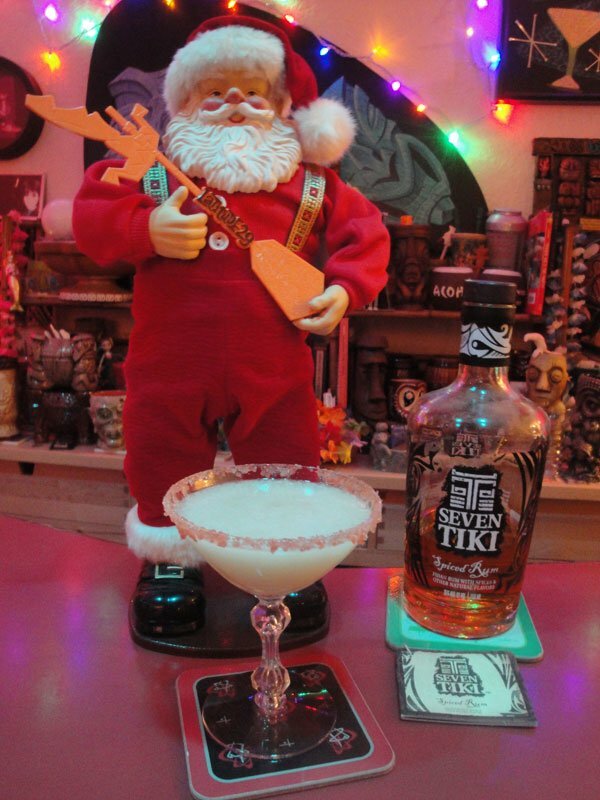 There’s a lot of news to report in this belated but special holiday edition of The Week in Tiki. We have details on The Mai-Kai’s 59th birthday party on Dec. 28, plus updates on The Hukilau in June. 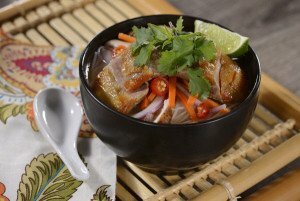 There’s a new restaurant in the Magic Kingdom’s Adventureland that celebrates the Jungle Cruise, plus more news from the Polynesian Village Resort. Holiday features include event recaps and photos, plus last-minute gift ideas and a special Christmas Day broadcast. Quick sips include 50 days of Fwaygo Rum recipes, a special Aloha shirt from Shag, news on FOM fundraising efforts, plus updates on Tiki bars across North America. Regular features spotlight the master ceramists known as Munktiki; instrumental legends The Ventures; new Las Vegas bar The Golden Tiki; and Professor Cocktail’s website. 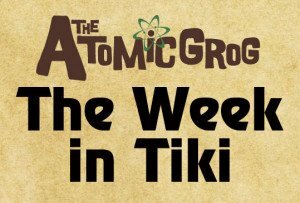 The Rum of the Week, Seven Tiki spiced, is featured in two seasonal cocktails: the Devil’s Island Daiquiri from Jeff “Beachbum” Berry, and Hapa Holidaze from The Atomic Grog. The Mai-Kai in Fort Lauderdale is giving back to its loyal fans and followers on Dec. 28 during its annual Mahalopreciation Party. In honor the historic Polynesian restaurant’s 59th anniversary, all guests in The Molokai bar will get 59 percent off most drinks and appetizers starting at 5 p.m. and running all night. A postcard from the 1960s. The large Tiki still stands on the northeast edge of the property. 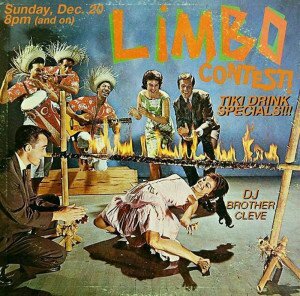 Voted the best Tiki bar in the world by Critiki.com users and recently named to the National Register of Historic Places, The Mai-Kai is considered to be the mecca of mid-century Tiki culture. It opened on Dec. 28, 1956, on sleepy Federal Highway and has survived decades of changing tastes by relying on its status as one of South Florida’s top tourist dining destinations and its legendary Polynesian Islander Review, the longest-running authentic South Seas stage show in the United States, including Hawaii. 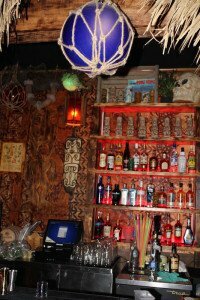 Just as crucial to The Mai-Kai’s success is the amazing decor, much if it brought back from the South Seas by original owners Bob and Jack Thornton, and more than 50 tropical drinks that are hailed by some of the world’s top cocktail enthusiasts. The secret recipes are descendants of some of the original drinks created by Tiki cocktail pioneer Don the Beachcomber in the 1930s. Bob Thornton took over the restaurant in 1970, and his family still runs The Mai-Kai to his exacting standards. The Dec. 28 party will include live music by guitarist-vocalist Rose-Marie starting at 6 p.m. The bar typically stays open until midnight, so you’ll have plenty of time to enjoy classic cocktails such as the Zombie and Barrel O’ Rum while partaking in the many pu-pus (Polynesian Chicken, Javanesian Beef, Spinach Salad) and new sushi rolls. You can easily make a meal out of the “small plates” in The Molokai. 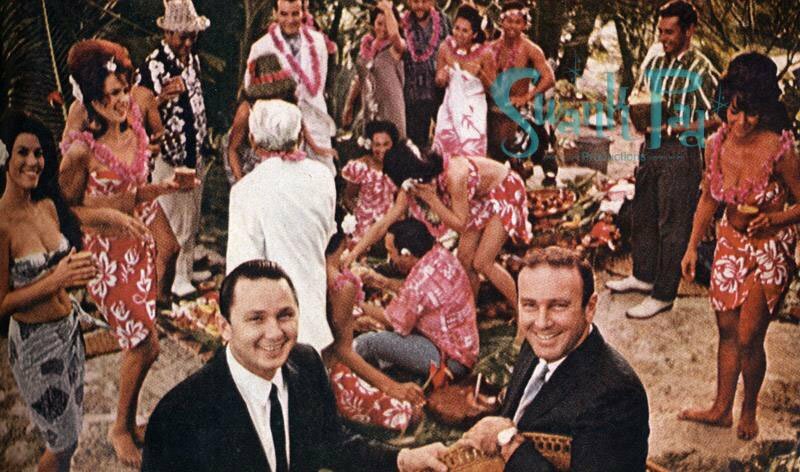 In related news, longtime Mai-Kai historian Tim “Swanky” Glazner has announced details on his upcoming book, Mai-Kai: History and Mystery of The Iconic Tiki Restaurant. Glazner, who has been passionately researching The Mai-Kai for more than 13 years, has channeled all his efforts into this 176-page, hard cover book due out early next year. It includes rare photos and images, plus first-hand stories that document the heyday of the mid-century Tiki era. It tells the story of The Mai-Kai’s creation, and its reign as the playground of celebrities and playboys in the 1950s and ’60s. [See previous Atomic Grog coverage] Swanky reports that the book should be available for pre-order soon. For updates, follow the links above or subscribe to his email list. Meanwhile, one of today’s most prolific contemporary artists continues to pay tribute to The Mai-Kai with hand-crafted Tiki mugs. Tiki Diablo, aka Danny Gallardo, is working on a new sculpt, which he posted on his Facebook page along with a request for feedback on potential glaze colors. Gallardo said he expects to have the mug in production next month. 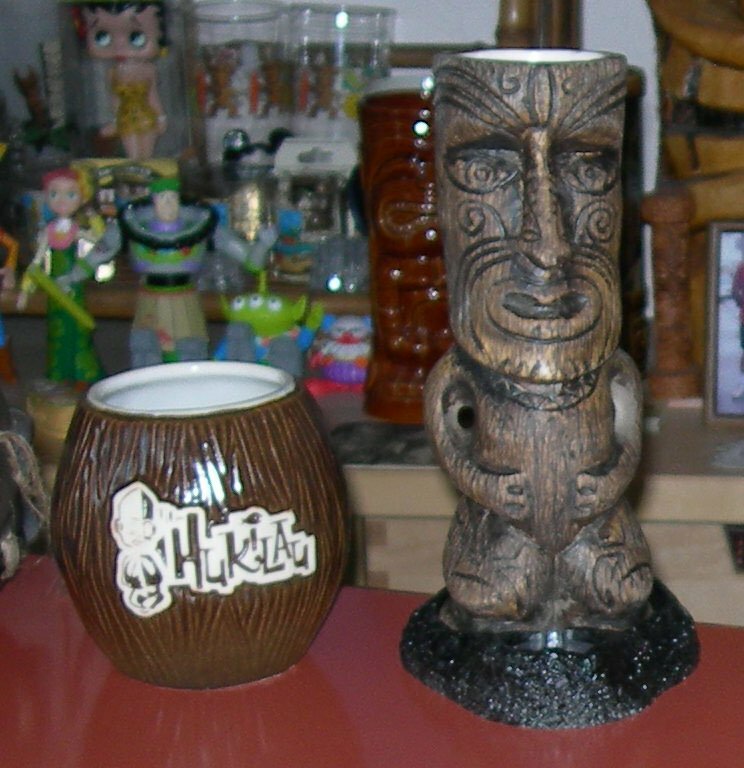 He previously created mugs that pay homage to iconic Tikis at The Mai-Kai in 2015 (see photo) and 2014 (see photo). He also created the 2012 and 2013 official mugs for The Hukilau, the latter also based on a famous Tiki at The Mai-Kai. In early 2016, look for a special announcement from The Hukilau regarding another historic Tiki from The Mai-Kai’s rich history. 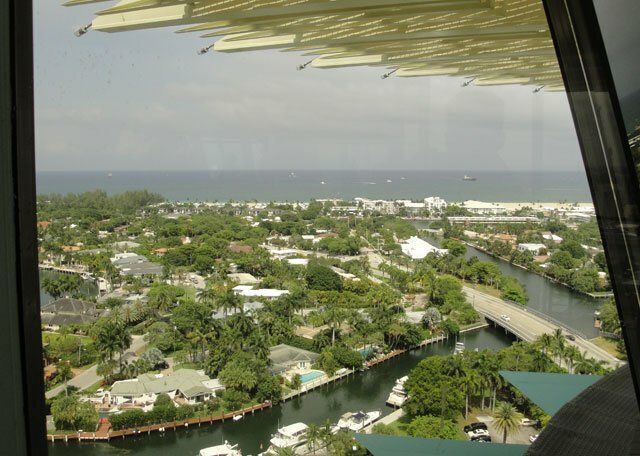 The Mai-Kai is at 3599 N. Federal Highway in Fort Lauderdale, on the west side between Commercial and Oakland Park boulevards. Call (954) 563-3272 for more information or to make dinner reservations. Free admission to the party. Valet and paid self-parking. The Mai-Kai’s famous Polynesian Islander Revue was established in 1961. Owner Mireille Thornton was a dancer in the original show. (Atomic Grog photo from The Hukilau 2015). 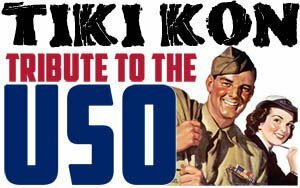 The first dinner show at The Mai-Kai during The Hukilau main event on June 11 is officially sold out, organizer Christie “Tiki Kiliki” White reports. Call The Mai-Kai at (954) 563-3272 to get on a waiting list or to reserve seats at the second or third shows of the evening. The early show usually features special on-stage presentations and entertainment, but White said that next year “there will be a few special things happening” during the second show as well. The third show will likely be a special midnight show. All three shows feature a special performance of the Polynesian Islander Review. Don’t miss out on your chance to celebrate the 60th anniversary of The Mai-Kai at the 15th anniversary of The Hukilau, set for June 8-12, 2016. 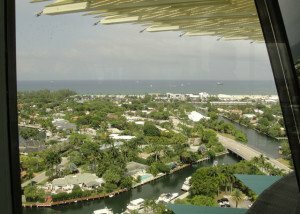 Also close to selling out is Shag’s SkyLounge, a June 9 special event in the 17th floor revolving cocktail lounge at Fort Lauderdale’s historic Hyatt Regency Pier 66 hotel. The event will offer a unique opportunity to sip Martinis while you “meet and mingle” with fellow guests and artist Josh Agle while the Pier Top Ballroom is transformed into a colorful Shag painting with mid-century modern furnishings. Tickets are $49 for the party, which runs from 10 p.m. to midnight and also includes live Bossa Nova music, spectacular night views, and a “dress as your favorite Shag character” contest with special prizes. Shag’s SkyLounge tickets are available exclusively to guests who buy a weekend pass. Four-day, three-day and two-day passes are available at 2015 prices until early January. Five-day passes are sold out. Shag’s SkyLounge follows the sold-out Tiki Tower Takeover, which returns to the Pier Top Ballroom on June 9 from 5 to 7 p.m. for a second year of Tiki cocktails served up by five of the country’s top barmen (Jeff “Beachbum” Berry, Martin Cate, Paul McGee, Brian Miller, and St. John Frizell) plus a special welcoming drink by another notable Tiki bar. 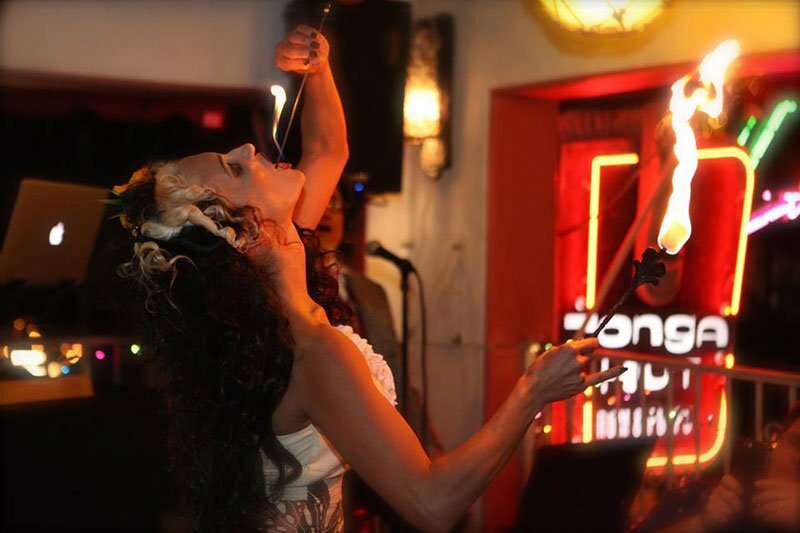 [See 2015 recap] The full lineup of bands and entertainers, more rum and cocktail events, a full lineup of symposiums (including Shag and Beachbum Berry), and much more will be announced in early January when passes go on sale at slightly higher 2016 prices. Symposium tickets and other special event tickets will be sold a la carte. White also urges potential villagers who want to stay at Pier 66 to make their room reservations now before all the available rooms are gone. The 59-year-old property includes smaller outlying buildings that date back to the 1950s in addition to the 17-story tower that was erected in 1965. Once the room supply is exhausted, The Hukilau will be offering special room rates at another nearby hotel, White says. To get the special rate ($129 for marina/pool view rooms, $149 for tower rooms, and $169 for tower junior suites), you must use the special link on The Hukilau website. 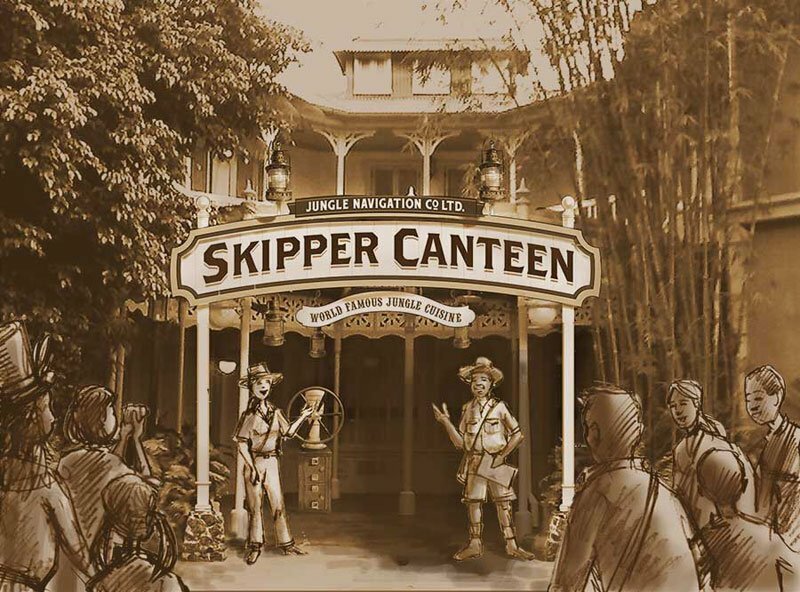 Those skippers on the famously kitschy Jungle Cruise attraction, which opened with both Disneyland (1955) and Disney World (1971), finally have a place to make a little extra cash when they’re not plying the tepid waters of the Magic Kingdom. 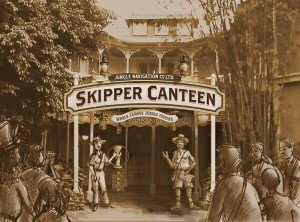 The Jungle Navigation Co. Ltd. Skipper Canteen is officially open for business in Adventureland on Dec. 16. A soft opening and cast member previews started on Dec. 13. The canteen appears to have extensive theming and encouragingly ambitious menu. There are nods to the Jungle Cruise as well as the Enchanted Tiki Room, and Disney World’s much-missed Adventurer’s Club from Pleasure Island at Downtown Disney. You can choose to dine in the main mess hall or the parlor once used by Dr. Falls and his family. Also, behind a once secret bookcase, you’ll find the cozy former meeting room of the Society of Explorers and Adventurers. In keeping with the theme, the restaurant’s servers, seaters and greeters are all well-versed in Jungle Cruise-style bad puns. Among the more exotic and interesting choices on the menu: Falls Family Falafel; Sustainable Fish Collar; Rice Noodle Bowl (with an Asian pho broth with choice of chicken, duck breast or tofu served with jalapeños and mix of fresh herbs); Trader Sam’s Head-on Shrimp (sustainable, local, farm-raised shrimp tossed in a chili-garlic sauce); Curried Vegetable Crew Stew; and Sugar-Crusted Congee Pudding. 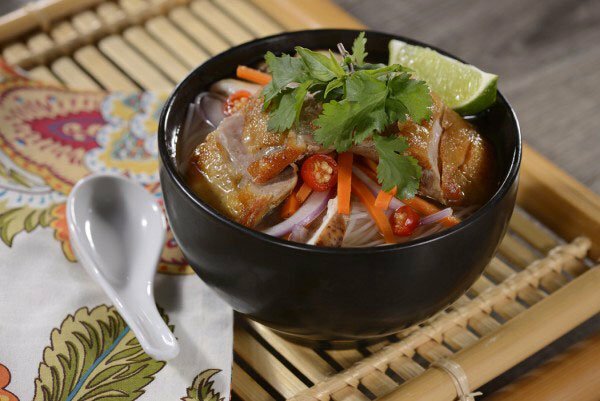 Vegans will be happy to know that they can enjoy both the noodle bowl and vegetable stew. There’s also steak, pork, chicken and plenty of options for carnivores, plus an allergy-friendly menu upon request. Entrees range from $17 to $34. Inside references also abound on the menu, from the S.E.A Shiu Mai to the Schweitzer Slush to the Kungaloosh! chocolate cake (named for the favorite cocktail at the Adventurer’s Club). Sadly, no alcohol is served at the Skipper Canteen like most of the rest of the Magic Kingdom (save for dinner at Be Our Guest in New Fantasyland). 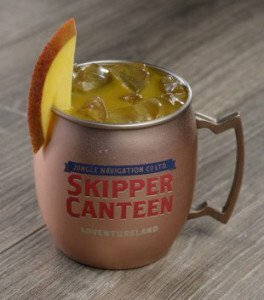 But the slush and punch come in a souvenir “Moscow Mule” inspired mug that you can take home. While it was rumored that the Skipper Canteen would offer a separate counter-service lunch similar to Be Our Guest, it appears that for now the same menu is being offered for lunch and dinner. And in a change from other sit-down restaurants, no advance dining reservations are being offered, at least for now. Guests must check in at the restaurant, where they can request to be notified by text if there’s a wait. Reports indicate that advance reservations will begin online and via phone in mid-January, 30 days after the opening. If you’re at the Magic Kingdom (or Disneyland) over the holidays, also be sure to catch the holiday edition of the attraction, dubbed the Jingle Cruise by its always punny skippers. 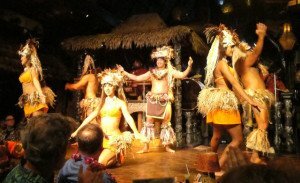 There have been many milestones in the massive renovation of Disney’s Polynesian Village Resort over the past two years: the unveiling of the new lobby at the Great Ceremonial House, the opening of Trader Sam’s Grog Grotto, and the launch of the Bora Bora Bungalows and new Disney Vacation Club timeshare units. But perhaps the most symbolic moment occurred in November with the return of the resort’s ceremonial torch-lighting ceremony. The traditional ceremony performed by entertainers from the resort’s Spirit of Aloha dinner show is held five times a week (Tuesday through Saturday) at 6 p.m. in the grassy area behind the Great Ceremonial House and in front of the refurbished pool. A lucky family is selected to assist in the ceremony, which marks the illumination of the signature flaming torches throughout the 39-acre resort. The ceremony, which was previously held at the front entrance, went on hiatus in mid-2014 during the extensive construction that has transformed the resort and returned it to its original name (previously it was simply Disney’s Polynesian Resort). Years in the planning stages, renovations began in earnest in the summer of 2014 with the closing of the resort’s main pool and removal of the Great Ceremonial House’s lush waterfall that had dominated the lobby since Disney World’s opening in 1971. The new lobby was unveiled in December, followed in April by Trader Sam’s, the Lava Pool and the DVC expansion. But the project is still not complete. After building the 20 lavish bungalows over the water on Seven Seas Lagoon and converting rooms in three existing longhouses into studio villas, Disney is continuing work on revamping the resort’s second pool to serve the DVC guests. The Oasis Pool is not expected to open until spring 2016. One of the A-framed buildings under construction will be a bar and grill, according to Polynesian Resort expert Steve “Tikiman” Seifert. This will bring the number of bars at the Polynesian to four, joining Trader Sam’s, the main pool’s Barefoot Bar, and the resort’s original watering hole, Tambu Lounge. Early birds note that the Tambu is now open and serving its full drink menu at 9 a.m. Seifert posted on his site that this appears to be a test, but it may become permanent. Food won’t be served there until 5 p.m., and closing time remains midnight. Trader Sam’s Grog Grotto and the outdoor Tiki Terrace continue to open at 4, but new closing hours have been in effect since November: 1 a.m. on Sundays-Thursdays and 2 a.m. Fridays and Saturdays. 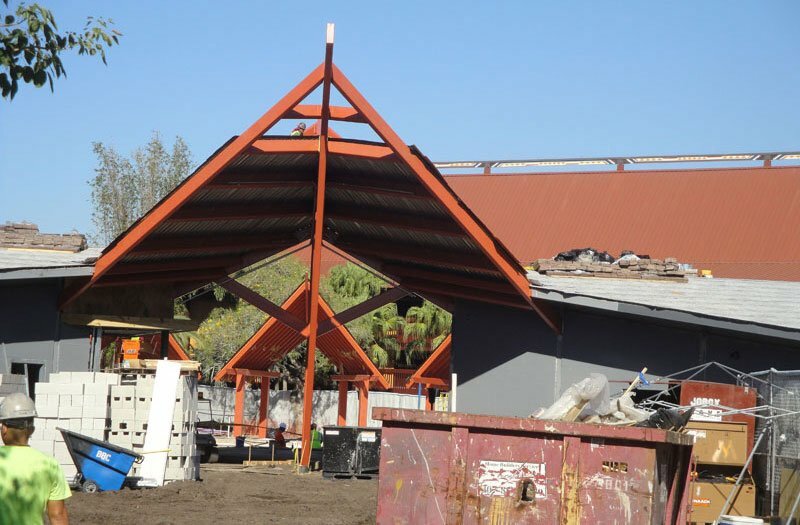 Seifert reports on his Polynesian Resort website that maintenance work is also ongoing on the exterior of the longhouses, many of which date back to 1971. They all received an extensive interior refurbishment prior to the resort’s overhaul. The Tikimanpages site is a great resource for extensive info on updates to the resort. Also, Seifert and his followers share almost daily updates and photos on his Facebook page. Don’t miss: If you’re planning on attending the Dapper Day festivities at Disney World on April 16, be aware that you can get a special group hotel rate at the Polynesian Village (subject to availability). To book, call (407) 939-4686 and use group code GO698312. Special rates are also being offered on rooms at Disney World’s Pop Century and Port Orleans Riverside resorts. On Dapper Day, a fashionable gathering of retro minded enthusiasts, participants will wear their finest threads while enjoying group activities at the Magic Kingdom. The Tiki community came together for a cause on Dec. 18 at the Tonga Hut in Palm Springs for the Caliente Christmas party, which benefitted Toys for Tots and the Palm Springs No Kill Animal Shelter. The shelter received 20 percent of all food and drinks sales (over $1,000) while partygoers donated 327 new toys. Entertainment included Emmett Hadley (aka Tony Marsico of the Martini Kings), MeduSirena (aka Marina the Fire Eating Mermaid), and Barry Martin (aka DJ Baz). The party’s hosts included Rory Snyder, organizer of the annual Tiki Caliente and Mod Palm Springs. 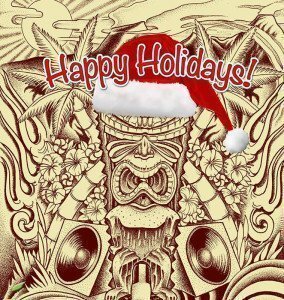 You can re-live the Dec. 12 holiday edition of the International Tiki Market Place at Don the Beachcomber in Huntington Beach by listening to the latest Zen Tiki Lounge podcast. The next International Tiki Market Place, the fourth anniversary of the event, is set for Jan. 23. On the East Coast, Boston’s Brother Cleve (the longtime musician, DJ, record producer, writer and connoisseur of cocktails) DJ’d during a special four-day event Dec. 17-20 at King Tai Bar in Brooklyn. The Tropical Holiday edition of Tour De Tiki also featured special cocktails crafted by Brother Cleve with Santa Teresa Rum, a rotating cast of other DJs and special surprises. Brother Cleve took a turn slinging drinks behind the bar on Friday and spinning a mix of Brazillian funk, dancehall and tropicalia on Sunday. 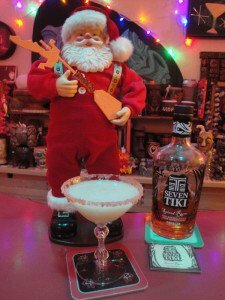 Tiki Brian and Exotic Tiki Island are doubling our pleasure for the holidays with a festive seasonal podcast, plus a special Christmas broadcast on ETI Radio running from 9 a.m. on Christmas Eve through Christmas Day. The podcast includes holiday favorites by The Blue Hawaiians, Jerry Byrd, The Surfers and many more, plus a bonus recipe for the Red-Nosed Zebra cocktail from Trader Sam’s Enchanted Tiki Bar at the Disneyland Hotel. The streaming online radio show will include Hawaiian, exotica, surf and Tiki Christmas music from Brian’s vinyl and digital collection, plus Hawaiian Santa stories for the kids, Santa Tracker updates from NORAD, plus more. Follow Brian at ExoticTikiIsland.com and on Facebook. If you can decide what to get your Tiki and retro friends this year, the gift of music may be the way to go. Double Crown Records is offering last-minute holiday gifts without shipping charges. Just go to DoubleCrownRecords.com and use promo code FREESHIP when you check out. The offer applies anywhere in the world for orders of $30 or more. In addition, nearly every Double Crown CD normally priced at $12.75 has been reduced for the holidays to $9.75. The sale runs through midnight on Dec. 23. Double Crown carries lots of great surf and instrumental rock, including the new albums from The Madeira, Boss Fink, and The TomorrowMen. There’s also a cool selection of holiday music. 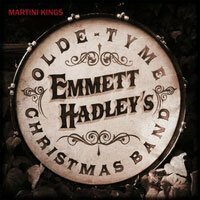 … If you’re looking for something a little more laid-back for Christmas, download the latest holiday release from the Martini Kings, Emmett Hadleys Olde Tyme Christmas Band (2014). Guaranteed to get you in the holiday mood. 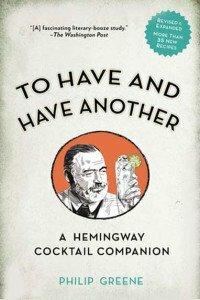 Cocktail traditionalists may want to check out the newly revised edition of Phillip Greene’s boozy bio, To Have and Have Another: A Hemingway Cocktail Companion, released in November. The updated 2012 opus includes six new Ernest Hemingway drinks, plus a bonus chapter with recipes from some of today’s top cocktail minds showing off their takes on Hemingway classics. Featured mixologists include Charlotte Voisey, Anistatia Miller, Jillian Vose, Sonja Kassebaum & Sarah McFarquhar, Chantal Tseng, Ted Haigh, Jeff “Beachbum” Berry, Simon Ford, Jason Kosmas, Dale DeGroff, Colin Field, Tony Abou-Ganim, Philip Duff, Julio Cabrera, Bryan Dayton, Aleš Puta, Lorenzo Antinori, David Andrle, Thobias Pettersson, Jared Brown, Jim Meehan, Dave Russell, Todd Appel, Carlton Grooms, Rocco Milano, Aaron Joseph, and Matty Gee. The book, with its original foreword by David Wondrich, is the last book you’ll ever need on the life and times of the legendary author (and drinker). 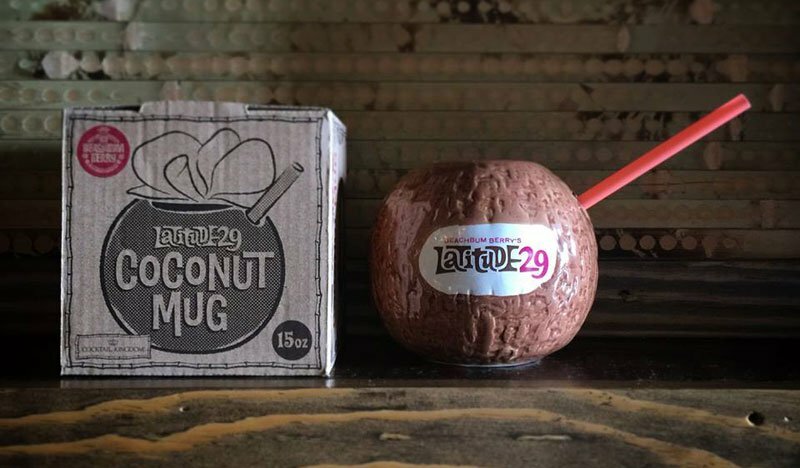 Just in time for the new year, Beachbum Berry’s Latitude 29 and Cocktail Kingdom will soon be releasing custom coconut mugs for the acclaimed New Orleans Tiki bar. Like most of the other Beachbum Berry barware, The mugs come in a specialy designed box and are high-quality products. Until they’re released online, you can find them at Latitude 29 for just $15, or $20 including a Painkiller cocktail. Catch Berry and Latitude 29 at The Hukilau in Fort Lauderdale in June. See details below. The Mai-Kai’s Kern Mattei (right) makes a Grapefruit Julep for Fwaygo Rum’s Luke Tullos. South Florida Distillers is celebrating its award-winning Fwaygo Rum with “Fifty Days of Fwaygo” (#50DaysofFWAYGO) on YouTube and Facebook, a series of videos that feature a new cocktail recipe every day through the end of the year. Featured drinks include classics (Daiquiris, Rum Punch, Negroni, Old Fashioned, Hot Buttered Rum) plus creative new concoctions (Sweet Potato Pina Colada, Sandia Borracha, Funky Fwaygo featuring Funky Buddha beer). Kudos to Luke Tullos, host of the always entertaining yet very informative short videos. One entire week was dedicated to Tiki drinks, including the classic Fogcutter and Volcano Bowl. Better yet, Tullos took his show on the road to Fort Lauderdale’s two top Tiki bars, where mixologists showed off some custom Fwaygo cocktails. At The Molokai lounge at The Mai-Kai, manager Kern Mattei presented the delicious Grapefruit Julep, which was created during Miami Rum Renaissance Festival in April. At Kreepy Tiki Lounge, Demi Natoli presented her creative Watermelon Mai Tai. Most of the cocktails feature the brand’s flagship white rum, which was launched early last year and took home a Best in Class award for premium white rum at the Miami Rum Festival. Also featured is the new limited-edition Grilled Pineapple rum. Fwaygo is not easy to find outside of South Florida, so if you’d like to try these cocktails and you’re outside the area, try another premium white rum with rich vegetal notes, such as Plantation 3 Stars. 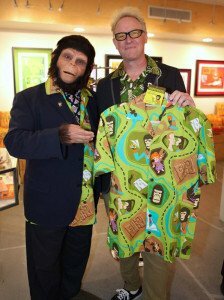 Shag the Store has released a special limited edition “Chimp” Aloha shirt and halter dress designed by Shag as a tribute to everyone’s favorite groovy primates. 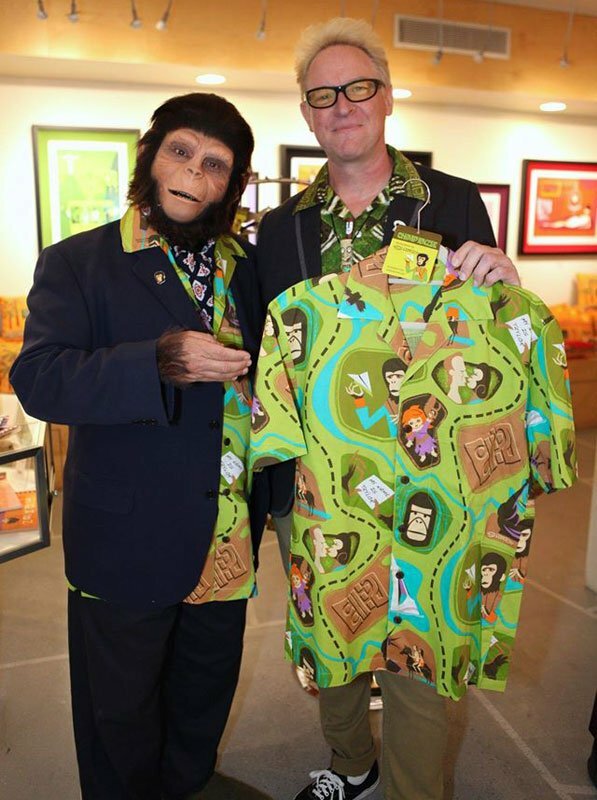 The 100% rayon shirts feature real coconut shell buttons, “perfect for your vacation to The Forbidden Zone or a night out in Ape City,” according to a press release announcing two special release parties. The limited run of 250 shirts ($125) and 50 dresses ($150) went on sale Dec. 16 exclusively at the Shag stores in West Hollywood and Palm Springs. The holiday store parties (Dec. 16 in West Hollywood and Dec. 18 in Palm Springs) included complimentary beverages and a special appearance by Cornelius, who traveled back from the future to model the swank new garments. Any remaining shirts and dresses went on sale on ShagTheStore.com beginning Monday, Dec. 21. 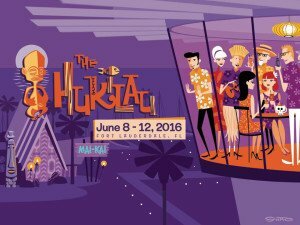 Don’t miss Shag at The Hukilau in Fort Lauderdale in June, when he hosts a living painting/cocktail party dubbed Shag’s SkyLounge in a rotating rooftop lounge, plus his first ever symposium at a Tiki event. See more info above. The Fraternal Order Of Moai has announced a donation of $11,500 to the Easter Island Foundation as the result of money raised during Ohana: Luau at the Lake in Lake George, N.Y., and Ohana: Luau by the Sea in Fort Lauderdale earlier this year. The non-profit organization, which was founded in 2005, made the foundation its national charity in 2008. Of the money raised at the 2015 events, $9,000 will fund four scholarships for youth from the island of Rapa Nui, while $2,500 will be donated to the foundation’s general fund. The foundation’s work includes promoting conservation and protection of the fragile cultural heritage of Easter Island and other Polynesian islands. 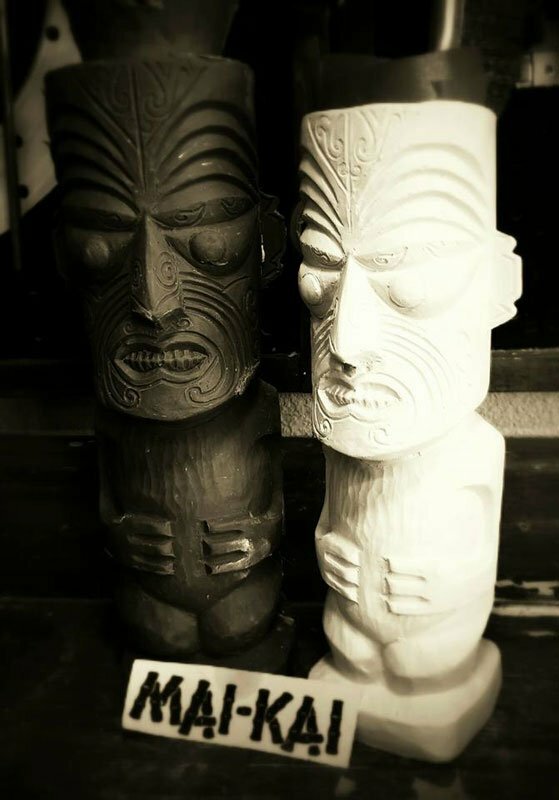 Earlier this year, $2,500 raised at the second Chicago Area Tiki Tour was donated to the Easter Island Foundation to fund the Fraternal Order of Moai Roger Carlson Scholarship. Tickets are expected to go on sale in January for the eighth annual Ohana: Luau at the Lake, scheduled for June 23-26 at The Tiki Resort in Lake George, N.Y. Also expect news on a new event mug by Squid. Coming in 2016: New Tiki bars in Pittsburgh, San Diego, Los Angeles, and more! Details in The Week in Tiki’s year-end edition. The guiding principles of Munktiki, the father and son team of longtime ceramists Paul and Miles Nielsen, are very simple: Create the world’s finest Tiki mugs and ceramic oddities. Their online store contains some of the most creative and whimsical designs on the market. It’s clear that these products are hand-crafted with loving precision along with a wacky sense of humor. Paul and Miles are consummate craftsmen, and everything is created by hand in their Portland pottery studio. Clients include Trader Vic’s, The Hukilau (see 2008 and 2010 mugs), Tiki Oasis, and Tiki Kon. Paul and his wife Debra ran their own ceramics company for three decades, selling their goods to stores, museum gift shops, and galleries. Miles began making ceramics at an early age, honing his skills in Japan with gallery shows, design licensing and a ceramic residency. 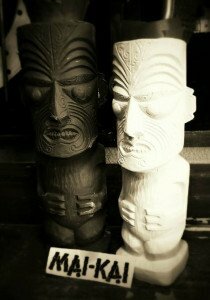 Paul created his first Tiki mug in 1997, then joined his father in 2000 to launch Munktiki’s highly respected line of limited-edition creations. When people call Tiki mugs works of art, this is what they’re referring to. This classic album was released 50 years ago this year. The most prolific and popular rock instrumental band of all-time is still going strong 57 years after forming in Tacoma, Wash. The Ventures, inducted into the Rock and Roll Hall of Fame in 2008, have sold more than 100 million records, including such enduring classics as Walk – Don’t Run (a No. 2 single in 1960) and Hawaii Five-O (No. 4 in 1969). During the band’s 1960 to 1972 heyday, 37 albums made the Billboard charts, including six in the Top 20. 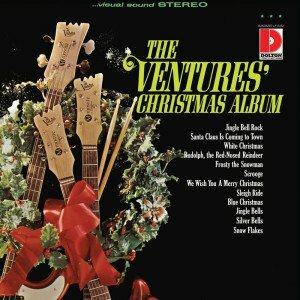 The influence of The Ventures is vast, from the thousands of surf guitar combos that sprung up in their wake to members of The Beatles, The Who and Led Zeppelin. In Japan, where the band still tours extensively, The Ventures are rock royalty. Still featuring founding and longtime members or their offspring, The Ventures are a living pop music history lesson. One of the band’s most endearing legacies is the classic 1965 Christmas album, a fixture in yuletide playlists for a half century. 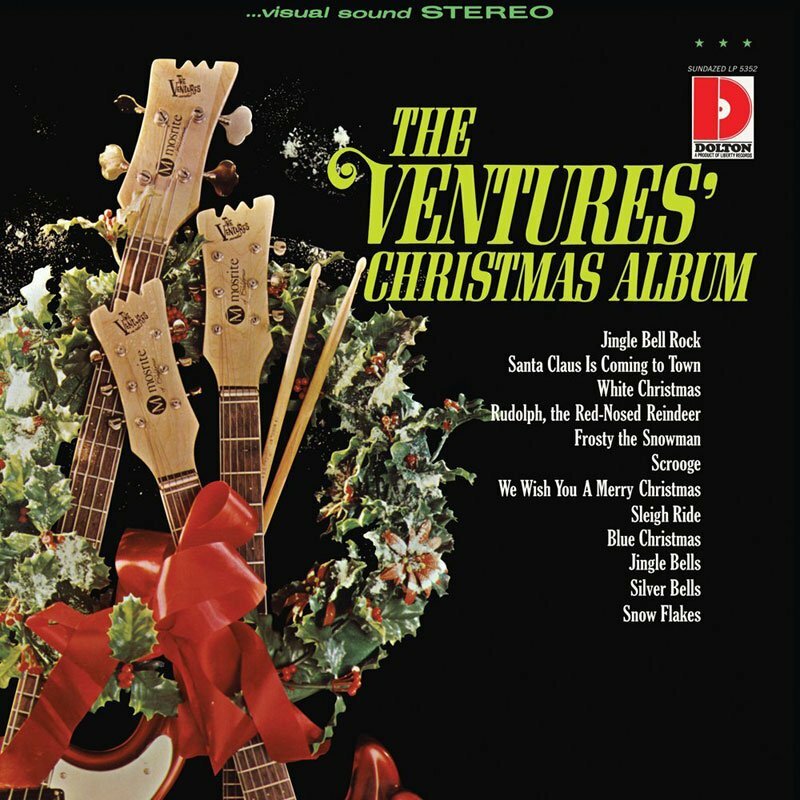 Guaranteed to spice up any seasonal party, the album features The Ventures mashing up surf-drenched riffs from their own catalog plus other 1960s classics with Christmas standards such as Sleigh Ride, Santa Claus Is Comin’ to Town, Jingle Bells, and White Christmas. You can’t help but smile while listening to this wonderful holiday treasure. 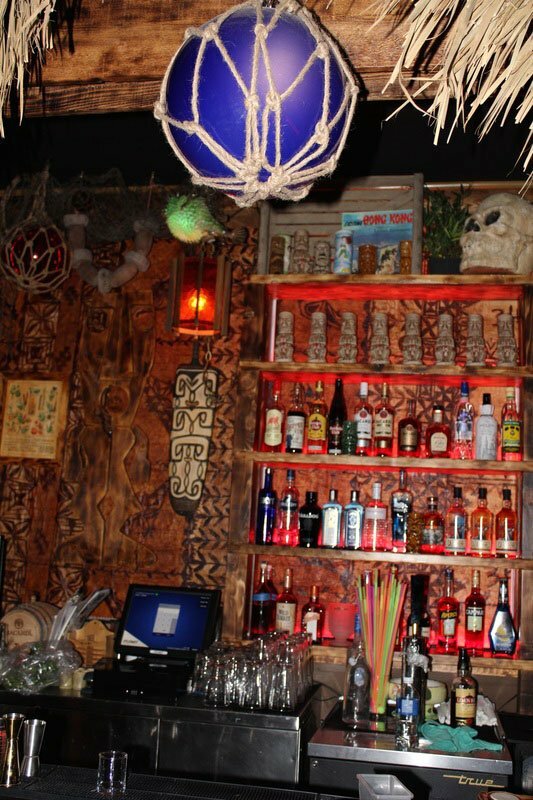 The brainchild of managing partner Branden Powers, a Las Vegas nightlife veteran who also happens to be a lifelong fan of Tiki and Disney-style theming, The Golden Tiki is a head-on collision of all of these influences that has quickly become a smashing success. Open less than five months, the lavish 4,000-square-foot fantasyland in Chinatown is physically not far from the Strip, but thematically it’s miles away from that notoriously garish district. 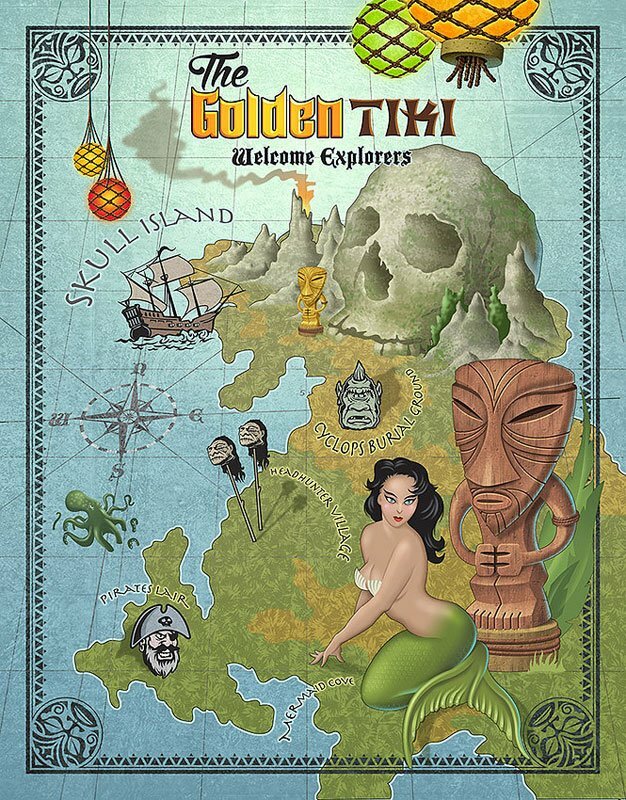 The Golden Tiki is in a world all its own, featuring themed areas such as Skull Island, Pirates Lair, Mermaid’s Cove and Headhunters Village, plus lots of over-the-top effects (an animatronic talking Tiki head and pirate, fountains, thatched huts, Hunter S. Thompson’s knife stuck in the wall). They even have a machine churning out Disney’s Adventureland staple, the Dole Whip. 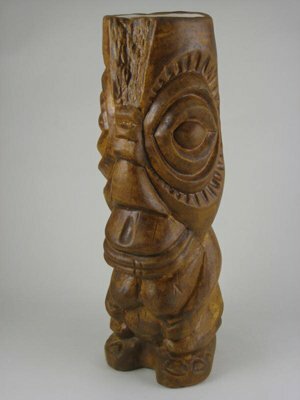 Some of the biggest names in Tiki art contributed their talents. Tiki Diablo designed the interior, Bosko and Billy Crud contributed many new carvings, and Doug Horne designed the cocktail menu (pictured at left). The drinks, most priced at just $11, have received the same attention to detail, from the Tiki classics (Navy Grog, Three Dots and a Dash, Mai Tai) to the house specials (Golden Tiki, Polynesian Haze, Kahuna Swizzle). For the truly adventurous, there’s a $35 Scorpion Bowl, $45 Zombie Punch Bowl, and $499 Treasure Chest. For cocktail connoisseurs, there’s a tableside Martinique Ti Service. The reviews are mostly positive, marred only by a so-so drinks rating on Critiki. So is The Golden Tiki’s initial success good luck, or the start of big things to come. I’d bet on the latter. Don’t miss: The Golden Tiki and manager Jim Kleiss will compete in The Art of Tiki: A Cocktail Showdown at the South Beach Wine & Food Festival on Feb. 26. Hosted by Food Network’s Guy Fieri, the event will feature nine of the country’s best Tiki bars competing for cash prizes. Guests can sample all the cocktails, plus tropical treats from some of South Florida’s top chefs. Tickets are on sale now. Don’t let the name fool you. Former history professor David J. Montgomery is no stuffy cocktail snob, and his website is full of fun and irreverent content plus two entertaining books. Of most interest to Tikiphiles is Professor Cocktail’s Zombie Horde: Recipes for the World’s Most Lethal Drink, an expansive collection that chronicles 86 recipes from the history and revival of the beloved cocktail. 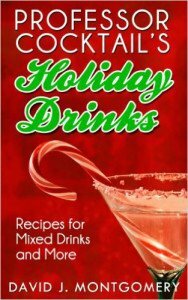 More relevant today is Professor Cocktail’s Holiday Drinks: Recipes for Mixed Drinks and More, which is loaded with 112 recipes that cover an eclectic mix sure to please all tastes at seasonal parties. Montgomery – who is also a noted book critic, author and newspaper columnist – has an easy-to-read yet authoritative style that make his reviews and recipes essential reading. And the good professor has a soft spot for Tiki, which is appreciated. Since launching in 2009, this Fijian spiced rum has carved out a small niche as a well-crafted, premium spirit in a category more known for it’s party image. 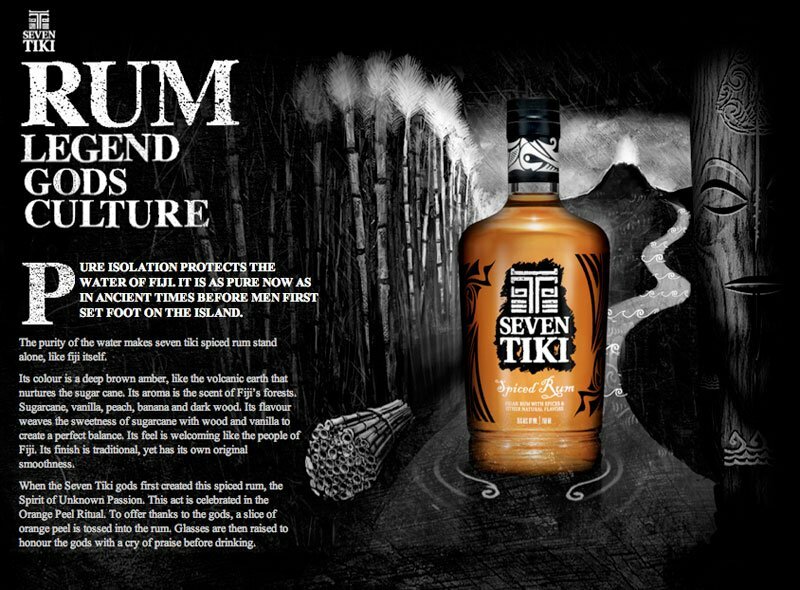 While many spiced rums are loaded with artificial flavors, Seven Tiki touts that its 70-proof rum is “made from the molasses of choice Polynesian sugar cane, exotic spices and virgin water drawn from deep beneath the Fiji’s volcanic highlands.” It’s produced at a small distillery in Fiji and also includes Indonesian nutmeg and Madagascar vanilla beans. A heavy vanilla flavor dominates, but you can also detect coffee, cocoa, cherry and nutmeg lingering amid the spicy notes with just a slight medicinal aftertaste. Seven Tiki also comes nicely packaged with a well-crafted back story about the legendary adventures of Polynesian navigators in the South Pacific. The navigators carved a Tiki into the helm of each of seven outrigger canoes, representing seven skills and qualities they would need to complete their journey across the open sea. Each bottle contains a booklet detailing the seven Tikis and what they represent, a cool touch. The distinctive screen-print bottles include motives of Fijian tattoos and references to the Seven Tiki legend. Note that the brand was created in 2006 with a premium white run, then sold to Bacardi. The spiced rum is distributed in the U.S., while an aged dark rum is produced for Europe. After a big initial marketing push, there seems to be little promotion these days. The SevenTiki.com website is returning errors and the Facebook pages abandoned. Which is a shame, because Seven Tiki is a quality product with a unique image that stands above many of the cheesy, overly hyped spiced rums dominating the market today. Berry, the acclaimed Tiki cocktail author and historian, offers up a frosty version of the classic Hot Buttered Rum. He suggests it in lieu of eggnog, and we wholeheartedly agree. 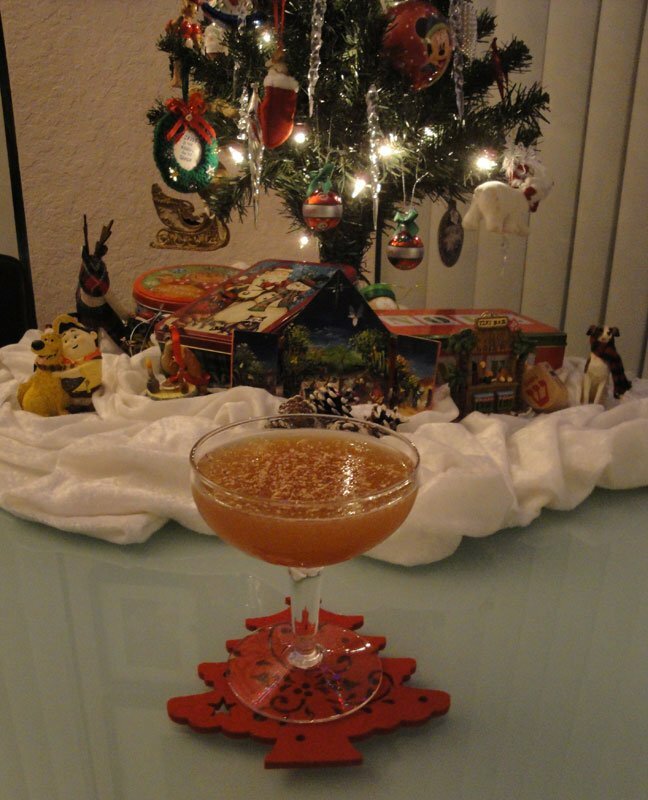 It’s a festive holiday cocktail for those who prefer their buttered rum cold and spicy. You may be aware of the honey-butter mix from Don the Beachcomber’s classic Pearl Diver and The Mai-Kai’s Deep Sea Diver. Berry also features it in the Pontchartrain Pearl Diver at his award-dinning Tiki bar, Latitude 29 in New Orleans. The butter is subtle, while the rich honey and sweet rum are balanced by the tart lime. Don’t skip the bitter-sugar rim, which adds a sweeet and spicy touch (Old Fashion bitters has a nice cinnamon/allspice flavor profile). Seven Tiki works well in this drink, providing just the right amount of background flavor and punch. Avoid dark or higher proof rums that may dominate the drink. However, if you seek an extra bit of flavor, I’ve added an optional spash of dark/aged rum as a great finishing touch. Don’t miss: Catch Jeff “Beachbum” Berry serving up cocktails the Tiki Tower Takeover at The Hukilau in Fort Lauderdale in June 2016. They’ll be joined by other top Tiki barmen, including Paul McGee (Lost Lake, Chicago), Martin Cate (Smuggler’s Cove, San Francisco), Brian Miller (Tiki Mondays With Miller, New York City), and St. John Frizell (Fort Defiance, Brooklyn). 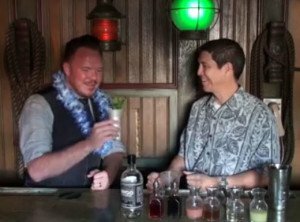 In early 2016, The Hukilau will be announcing a new cocktail symposium by Berry, who has been appearing at the East Coast’s largest Tiki weekender since 2006. Shake heartily with 1 cup of ice and strain into a chilled cocktail glass. Dust with freshly grated nutmeg. Inspired by the Devil’s Island Daiquiri, I challenged myself to come up with a new cocktail featuring spiced rum and holiday flavors that still had classic Tiki elements. Don’t forget the nutmeg: It adds a nice aromatic element. Same as above, stick with a smooth spiced rum like Seven Tiki and avoid anything too dark or heavy. The spices combine with the rum to create a punch-like drink that goes down easy. Angostura can be used in a pinch, but try to find a bottle of whiskey bitters to add a unique flavor that reminds me of bourbon eggnog. If you don’t have ginger syrup, a rich simple syrup would probably be OK. Simply scale up the proportions to create a potent punch for your next holiday gathering. Mele kalikimaka! 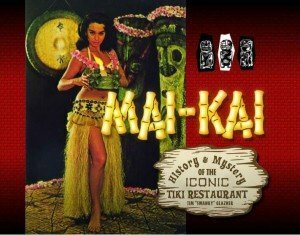 * Dec. 28 – 59th anniversary Mahalopreciation Party, The Mai-Kai in Fort Lauderdale. 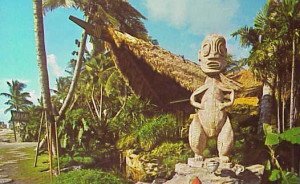 This entry was posted in 2016, Art, Attractions, Cocktails, Culture, Disney World, Events, Events, Events, Food, History, History, Hukilau, Magic Kingdom, Mai-Kai, Music, Other Florida, Recipes, Resorts, Restaurants, Reviews, Rum, South Florida, The Week in Tiki, Tiki mugs, Video and tagged Adventureland, Beachbum Berry, Bob Thornton, Brother Cleve, Cocktail Kingdom, cocktails, Devil's Island Daiquiri, Disney World, Disney's Polynesian Village Resort, Double Crown Records, Exotic Tiki Island, Forbidden Island, Fraternal Order Of Moai, Fwaygo Rum, Grapefruit Julep, Hapa Holidaze, Hukilau, Huntington Beach Don the Beachcomber, International Tiki Market Place, Jungle Cruise, Kern Mattei, Kreepy Tiki, Latitude 29, Magic Kingdom, Mai-Kai, Mai-Kai: History and Mystery of The Iconic Tiki Restaurant, Marina the Fire Eating Mermaid, Martini Kings, Molokai bar, Munktiki, Ohana: Luau at the Lake, Ohana: Luau by the Sea, Pier 66, Polynesian Islander Revue, Polynesian Resort, Professor Cocktail, recipe, rum, Seven Tiki, Shag, Shag the Store, Shag’s SkyLounge, Shameful Tiki Room, Skipper Canteen, South Florida, surf, Swanky, The Golden Tiki, The SOS, The Ventures, Tiki Caliente, Tiki Diablo, Tiki Kiliki, Tiki Tower Takeover, To Have and Have Another: A Hemingway Cocktail Companion, Tonga Hut, Walt Disney World, Zen Tiki Lounge. Bookmark the permalink. 9 Responses to The Week in Tiki (Nov. 30-Dec. 13, 2015): The Mai-Kai anniversary party, The Hukilau updates, Jungle Cruise restaurant at Disney World, Polynesian Resort lights torches, plus more! And a 6.6 for drink quality on Critiki does not equal a good tiki bar. J, thanks for your thoughts. First, be aware that all of the weekly spotlights (Bar of the Week, Artist of the Week, etc.) are not critical reviews. I try to keep pure criticism out of The Week in Tiki. 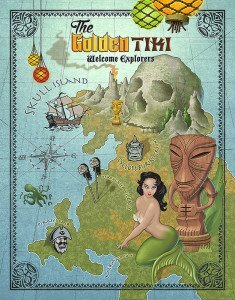 It’s more like a news report that shines a spotlight on everything significant in the world of Tiki, and The Golden Tiki certainly fits the bill. However, we should have noted that low Critiki drinks rating (it’s since been added). It stands out among all the other ratings, including 9.5 for decor. Of course, drinks are of prime importance. I haven’t been there personally to sample the menu, but I’m looking forward to critiquing their offerings at the The Art of Tiki: A Cocktail Showdown at the South Beach Wine & Food Festival. I’m curious as to why I see other people’s names associated with the carvings in the Golden Tiki. As far as I know, Billy Crud did ALL of the carvings! Please do your research and find out for sure. Oops! There are a couple of things from the other people you mentioned. My apologies. Glad to see the Golden Tiki getting press. I’ve visited twice so far and been pleased each time. I just hope that the bad location doesn’t sink them. HH, thanks for the tip off about the Latitude 29 coconut mugs. Golden Tiki needs to improve their cocktail making quality and it’ll be fine. Décor is great. Location is fine, actually. But all three times I’ve been the drinks have either been “off”/unbalanced or tasted watered-down for some reason. I’m a fan of Frankie’s, too, but I have found the drinks there tend to be “unbalanced” too, when they are busy. Has the drink quality slipped that much since they opened? I was there in the days immediately following their press party and they were serving pretty liberal pours of Cana Brava and Coruba.